Taking occasional breaks is an integral part of the workday, but when you get deep into a project, it can be hard to tear yourself away. If you're the kind of person who regularly sits down at a computer and then doesn't look up for the next eight hours, there's a browser extension that can help, according to Lifehacker. A Google Chrome extension called Break Timer is designed to remind you to take a break from staring at your screen, creating customizable pop-ups at set intervals to ensure that you look up every once in a while. Occasionally looking up from your computer screen isn't a leisure; it's necessary if you want to stay healthy and productive. The American Optometric Association recommends taking a break to look at something beyond your computer (ideally at least 20 feet away) once every 20 minutes to reduce digital eye strain, which can lead to headaches, dry eyes, blurred vision, and other issues. Studies have also found that workers who take short breaks throughout the day are more productive than workers who stay chained to their desk all day, trying to power through fatigue and boredom. Break Timer lets you customize your alerts so they either show up as small desktop notifications or as a full-screen window of color. It lets you set the interval at which you want to be reminded to take a break as well as the text you see when the reminder pops up. It also allows you to skip or postpone breaks if you think you need just a few more minutes of concentration. It can also restart your counter if you've been away from your computer for a long time (since you're clearly already taking a break). Not sure how long to set your reminder intervals for? In 2014, a productivity app called DeskTime found that its most productive users spent an average of 52 minutes working before taking a 17-minute break. Other productivity gurus recommend the Pomodoro Technique, which consists of 25 minutes of work followed by a 5-minute break. 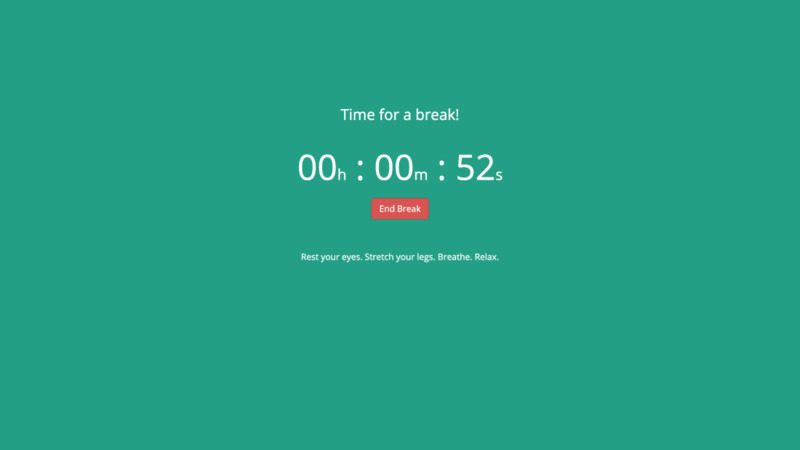 Get Break Timer for Google Chrome here.